Windows 10 Insider Preview Build 17115 (RS4) to Windows Insiders in the Fast ring. This week we have 50 Windows Insider MVPs on campus as a part of the global MVP Summit. It’s been a pleasure to get face-to-face time with some of our biggest advocates as well as the people who help the overall Windows community the most. Today, we are releasing Windows 10 Insider Preview Build 17115 (RS4) to Windows Insiders in the Fast ring. This spring, we will release an update to Windows 10 that will include changes to the set up experience for privacy settings. This new design conveys focused information to help our customers make focused choices about their privacy and offers two new settings for Inking & Typing and Find my device. More details about the change can be found in this blog post here. We fixed an issue where If you tried to open a file that was available online-only from OneDrive that hadn’t been previously downloaded to your PC (marked with a green checkmark in File Explorer), your PC could bugcheck (GSOD). We fixed an issue where post-install at the first user-prompted reboot or shutdown, a small number of devices experienced a scenario wherein the OS fails to load properly and might have entered a reboot loop state. We fixed an issue where the Microsoft Store might be completely broken or gone altogether after upgrading. We fixed an issue where when you denied Movies & TV access to your videos library (through the “Let Movies & TV access your videos library?” popup window or through Windows privacy settings), Movies & TV would crash when you navigated to the “Personal” tab. We fixed an issue from recent flights resulting the Direct Messages section of Twitter.com potentially not rendering in Microsoft Edge. We fixed an issue impacting the Italian touch keyboard layout where the period key would act as a delete key in UWP apps. We fixed an issue impacting the Czech touch keyboard layout where numbers on the &123 view couldn’t be inserted into UWP apps. We fixed an issue where the controls in the Focus Assist Settings subpages didn’t have accessible labels. We fixed an issue from the last few flights where after launching, minimizing, then closing UWP apps enough times, you would stop being able to launch UWP apps. Windows 10 Insider Preview Build 17123 (RS4) to Windows Insiders in the Fast ring. Today, we are releasing Windows 10 Insider Preview Build 17123 (RS4) to Windows Insiders in the Fast ring. Windows 10 Insider Preview Build 17623 (RS5) to Windows Insiders who have opted into Skip Ahead. Today, we are releasing Windows 10 Insider Preview Build 17623 (RS5) to Windows Insiders who have opted into Skip Ahead. Windows 10 Insider Preview Build 17120 (RS4) to Windows Insiders in the Slow ring. Today, we are releasing Windows 10 Insider Preview Build 17120 (RS4) to Windows Insiders in the Fast ring. 1. Navigate to Local Group Policy Editor > Administrative Templates > Windows Components > Windows Defender Application Guard. [ADDED 3/14] On PCs with Dolby Access app installed and expired Dolby Atmos, the Windows Audio service (audiosrv) crashes with a stack overflow exception and the PC won’t have sound. A workaround is to uninstall the Dolby Access app to get sound back. New build available: Windows 10 Insider Preview Build 17128 (RS4) to Windows Insiders in the Fast ring. On Build 17128, you will notice that the watermark at the lower right-hand corner of the desktop has disappeared. This does not mean this is the final build as we are not done yet. We’re just now beginning the phase of checking in final code to prepare for the final release. The only difference between this build and Build 17127from Tuesday is the removal of the watermark. However, we’ve got more fixes being checked in for the next flight. New build available: Windows 10 Insider Preview Build 17133 (RS4) to Windows Insiders in the Fast ring. UPDATE 3/30: We have released Windows 10 Insider Preview Build 17133 (RS4) to Windows Insiders in the Slow ring. As part of this flight, we are testing the engineering systems responsible for the deployment of Windows 10 feature updates to customers. As such, not all Insiders in the Slow ring will be immediately targeted to receive this flight. We are targeting full availability to the Slow ring on Monday 4/2 however, if you’d like to install immediately, a manual check for updates under Settings > Update & Security > Windows Update will present the build. Today, we are releasing Windows 10 Insider Preview Build 17133 (RS4) to Windows Insiders in the Fast ring. Just like in Build 17128, you will also notice that the watermark at the lower right-hand corner of the desktop has disappeared in Build 17133. Again, we are in the phase of checking in final code to prepare for the final release. New build available: Windows 10 Insider Preview Build 17639 for Skip ahead. Coming soon: We’re planning to enable Sets for more Win32 (desktop) apps including Office! In order to try this new experience out with Office, you’ll need to be an Office Insider running the latest Office builds. Sign-up to be an Office Insider todayif you aren’t already! Windows Calculator has been updated (version 10.1803.711.0) to now correctly calculates square roots for perfect squares (integers that are squares of other integers). Because of the arbitrary precision arithmetic library used by the Calculator app, the square root calculation is an approximation calculated using the Exponential Identityfunction. Today, we are releasing Windows 10 Insider Preview Build 17650 (RS5) to Windows Insiders who opted in to Skip Ahead. 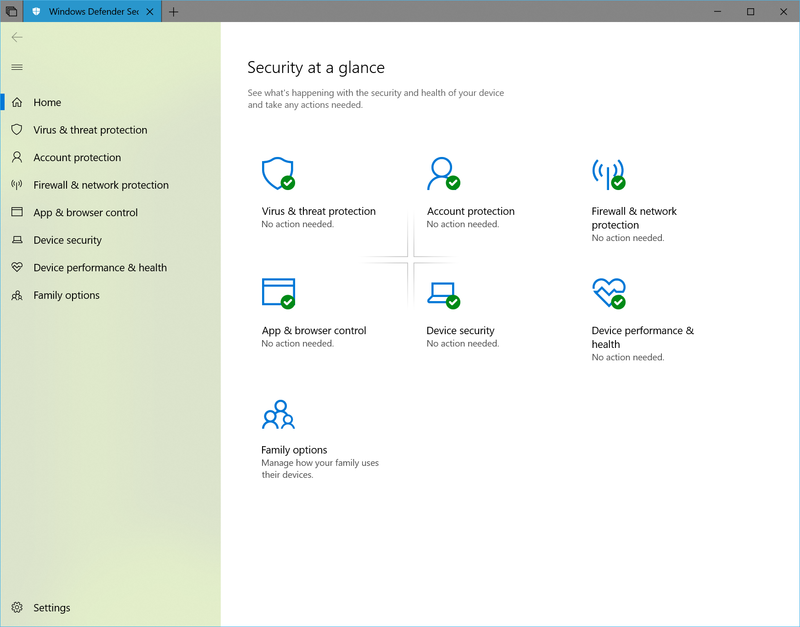 We’ve heard your feedback and when you install this build you’ll find we’ve updated Windows Defender Security Center (WDSC) to include the Fluent Design elements you know and love. You’ll also notice we’ve adjusted the spacing and padding around the app and will now dynamically size the categories on the main page if more room is needed for extra info. Last but not least, we’ve also updated the title bar of the app so that it will now use your accent color if you’ve enabled that option in Color Settings – with Sets enabled, you will see this color in the WDSC tab. You can add specific rules for a WSL process in Windows Defender Firewall, just as you would for any Windows process. Also, Windows Defender Firewall now supports notifications for WSL processes. For example, when a Linux tool wants to allow access to a port from the outside (like SSH or a web server like nginx), the Windows Defender Firewall will prompt to allow access just like it would for a Windows process when the port starts accepting connections. This was first introduced in Build 17627. We fixed an issue where File Explorer would always open with the ribbon minimized, rather than remembering how you’d left it. We fixed an issue where elements on the main page of the Windows Defender Security Center app would slightly change size on mouse hover. We fixed an issue where non-default languages might unexpectedly have the option to remove in Settings greyed out. We fixed an issue where the Color Filters and High Contrast icons were switched in Settings. We fixed an issue where clicking links in Settings that launched other apps would result in Settings crashing and nothing else happening. We fixed an issue resulting in some people experiencing a Settings crash when navigating to Apps > Default Apps > Set defaults by App. The IME now uses the same UX for Expressive Input as other languages. You can bring it up by clicking the emoji button in the IME toolbar, or use the Emoji Panel hotkeys (WIN + period (.) or WIN + semicolon ( ). You can browse between Emoji, Kaomoji, and Symbol input when Chinese (Simplified) is the active locale. A new build was released to the Fast ring in addition to those who opted in to Skip Ahead. Should apps and websites open in a new window or a new tab? It’s up to you!The Sets section of Multitasking Settings now lets you set your windowing preference. If you choose “Window”, new windows won’t open into a new tab unless you explicitly click the + or drag with your mouse. Choosing “Tab” opens any new windows invoked from your running apps into tabs. As a reminder, if you would like to exclude any particular app from Sets, you can do this from this same settings page. Apologies as recent builds were missed due to gaming lol. Microsoft released Windows 10 Insider Preview Build 17686 (RS5) to Windows Insiders in the Fast ring in addition to those who opted in to Skip Ahead. [ADDED 6/7 for @Stanzilla] This build includes MSIX support. Using the SDK Build 17682 and higher, you can package your apps as MSIX. Microsoft release Windows 10 Insider Preview Build 17692 (RS5) to Windows Insiders in the Fast ring in addition to those who opted in to Skip Ahead. Today, we are releasing Windows 10 Insider Preview Build 17692 (RS5) to Windows Insiders in the Fast ring in addition to those who opted in to Skip Ahead. Updated on 6/15 to include two new changes in the build that were missed previously. Storage Sense picks up a new skill: Starting with the Creators Update we embarked on a journey to help you automatically clean up storage when low on disk space. We expanded on that with the Fall Creators Update (here and here), and today we’re taking the next step by adding the ability to automatically make any downloaded Files On-Demand online-only if you haven’t used them in a certain number of days. Head to Settings > System > Storage > Storage Sense to try out this new feature! We’d love to hear what you think. We’ve got two stories from the Insider Community we want to highlight! What do ninja cats and dragons have in common? Find out in this story, featuring an Insider who brings her creations to life with Windows Ink and Universal Windows Platform. The Sisters of Mercy help people in harm’s way. Their IT Director is an Insider who protects the nuns from a different kind of threat. Check out our latest Insider Story. Our next Bug Bash will be from June 22nd – July 1st – we will be holding a Bug Bash Webcast on our Mixer channel on June 27th, exact timing will be announced closer to the date. We’re excited to do another Bug Bash with our Windows Insiders! Today, we are releasing Windows 10 Insider Preview Build 17723 (RS5) to Windows Insiders in the Fast ring and Build 18204 (19H1) to Windows Insiders who have opted in to Skip Ahead. Going forward, RS5 builds will come from the RS5_RELEASE branch. For Insiders who chose to “skip ahead”, 19H1 builds will continue to come from the RS_PRERELEASE branch. Insiders can see the branch name in the watermark at the lower right of their desktop. Right now, the builds from these branches are largely the same which is why we’re only doing a single blog post for both of today’s new builds. However, in the future we will be doing separate blog posts for each. To summarize all this, see the below graphic that explains what Skip Ahead is. Today we are excited to announce that we are adding the ability to peer into your physical environment through Flashlight – without removing your headset! With the latest Windows Insider Program build, you can open a portal into your real world at any time via the Start menu, a button shortcut, or a voice command. This opens a low-latency pass-through camera feed connected to your controller. It’s comfortable, intuitive, and keeps you immersed. Hope you enjoyed World Emoji Day, last week! For those who haven’t already heard, Unicode 11 comes with 157 new emoji – as of today they’re now available for Insiders to try in the build. Including superheroes, redheads, a softball, a pirate flag and a llama all made the cut. You can access them using the Emoji Panel (WIN+.) or the touch keyboard. For a full write up with more details about these new improvements, please see our announcement here. We’ve been using this model on internal devices, and we’ve seen promising results upon rollout. Due to the nature of its architecture, we’re able to update the model with minimal turnaround time based on our insights from its performance. It’s all thanks to our cloud infrastructure. If you find your device restarting at the wrong time, please file a bug in the feedback hub with the details on your experience. (i.e. I went to grab a cup of coffee for 5 minutes and it updated!). We would love to hear your stories and take it into account when training our update model. We fixed an issue resulting in the tops of apps in tablet mode being clipped (i.e. missing pixels). Not fixed. We fixed an issue causing Narrator speech to fade when waking from sleep mode. We fixed an issue where the error “Your fingerprint couldn’t be recognized. Try using a different finger.” was displaying unexpected characters in place of the apostrophe. ADDED: There is an issue where the tops of apps in tablet mode being clipped (i.e. missing pixels). Join us for our second RS5 Bug Bash running from July 27th through to August 5th, 2018. You know the drill – get your quest on! With the second RS5 Bug Bash, Insiders in the Slow ring can also participate! AND we’ll be doing a Mixer webcast on Wednesday August 1st at 10am PDT. Also – you can enter to win a trip to Microsoft’s campus here in Redmond, WA! Check the news section for new releases. I Just had a motherboard issue and had to reset windows. At first I did a reset rtrying to keep my files than a full reset. The computer works well but I cannot see all of the shared folders on my network anymore. before the same version of windows on this computer used to work accessing a shared folder and now it does not. I am confused of why. Hi there, I'm running build_"18356" with no issues so far .